Minuteman Press International is the world’s leading printing, marketing, and design franchise. 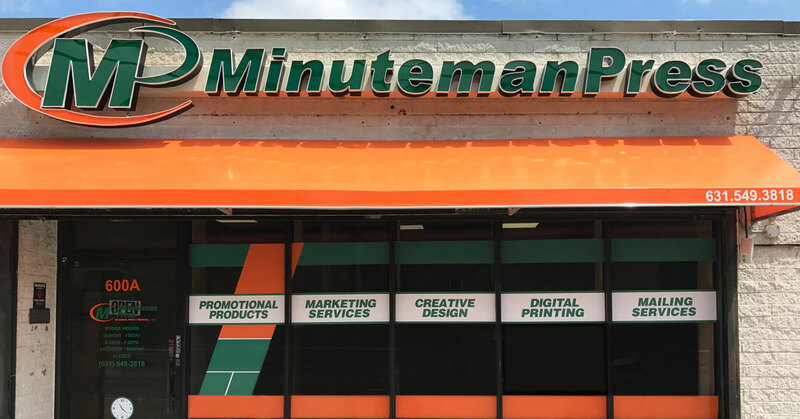 With over 45 years of experience putting people into business, Minuteman Press continues to thrive as a family-owned and operated franchisor with a winning franchise business model that has been refined for repeated success. In 2019, Minuteman Press has once again been recognized as the #1 printing and marketing franchise by Entrepreneur — the 27th nod and the 16th year in a row the Farmingdale, New York business service franchise has been named the best of the best. Minuteman Press, with nearly 1,000 locations in the U.S., Canada, South Africa, Australia, and United Kingdom, has earned the stellar franchise ranking with a proven brand that provides excellent quality and service to local business owners and unparalleled training and local ongoing support to its franchisees. Minuteman Press International also offers a unique royalty incentive program. “Minuteman Press is a franchise that has developed and fine-tuned for over 45 years. Look around your office, your house, businesses you visit, stores you shop at, or restaurants you dine at. You will see products and services we offer such as promotional items like pens or mugs, forms and flyers, custom branded apparel, postcards, signs, banners, and more. That's because all businesses – regardless of their size or industry and whether they're brand new, well-established companies, government organizations, or nonprofits – need and use printing and marketing materials every business day,” says Nick Titus, Vice President at Minuteman Press International. Minuteman Press was focused on creating a strong franchise system from the start. Company founder Roy Titus wanted to break the cookie-cutter franchise mold with partners who would bring their own entrepreneurial spirits and ideas to the table. Alongside his son, Bob Titus, who still serves Minuteman Press as President and CEO today, the pair built a proven franchise model with a competitive edge. Over the years, Minuteman Press has continually taken advantage of technology to boost efficiencies, developing proprietary business management, pricing, and marketing software, and introducing client dashboards for reorders, file transfers, and proofing. For franchisees, Minuteman Press is a solid investment, with multiple revenue streams, ongoing local and corporate support, a royalty incentive program, and a flexible business model that is backed by experienced leadership. Strategically placed regional offices have long been a staple of the brand to help ensure each franchise owner has the support they need. Poised for continued growth as a leader of the modern printing industry, Minuteman Press is looking to expand with “down to earth people” who are willing to work hard and understand what it takes to run a successful franchise. “You do not need experience to run this franchise but you do have to be willing to follow the system and work hard,” says Titus. “The majority of Minuteman Press owners don’t have a background in the industry,” notes Titus. “Our owners are business people, who are active within their local community and pride themselves on excellent quality and service. They have the knowledge and support of a proven franchise system to help businesses develop brand awareness and grow. Learn more about this unique franchise opportunity. Visit minutemanpressfranchise.com today!